Author: Kotlowitz, Alex Set In . . . 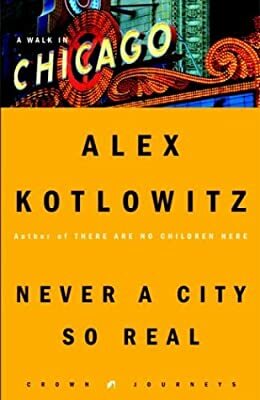 Description: The acclaimed author of There Are No Children Here takes us into the heart of Chicago by introducing us to some of the city’s most interesting, if not always celebrated, people. Chicago is one of America’s most iconic, historic, and fascinating cities, as well as a major travel destination. For Alex Kotlowitz, an accidental Chicagoan, it is the perfect perch from which to peer into America’s heart. It’s a place, as one historian has said, of “messy vitalities,” a stew of contradictions: coarse yet gentle, idealistic yet restrained, grappling with its promise, alternately sure and unsure of itself. Chicago, like America, is a kind of refuge for outsiders. It’s probably why Alex Kotlowitz found comfort there. He’s drawn to people on the outside who are trying to clean up—or at least make sense of—the mess on the inside. Perspective doesn’t come easy if you’re standing in the center. As with There Are No Children Here, Never a City So Real is not so much a tour of a place as a chronicle of its soul, its lifeblood. It is a tour of the people of Chicago, who have been the author’s guides into this city’s—and in a broader sense, this country’s—heart.